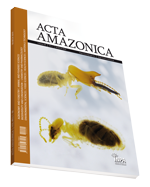 Authors: FONSECA, O. J. M.; SALEM, J. I.; GUARIM, V. L.
Authors: BARROS, M.S. de; MARIZ, G.
Authors: TADEI, W. P.; SANTOS, J. M. M. dos; RABBANI, M. G.
Authors: CAVALCANTE, S. de H.; ROCHA, A. I. da; YASHIDA, M.; GOTTLIEB, O. R.
Authors: ROCHA, A. I. da; LUZ, A. I. Reis & RODRIGUES, W. A. Authors: PETERSON, N. E. & PINE, R. H.
Authors: RAFAEL, J. A.; FAIRCHILD, G. B.; GORAYEB, I. S.
Authors: FLECHTMANN, C. H. W. & CASTELO, F. P.
Authors: WOLTER FILHO, W.; CABRAL, J. A. da S.; ROCHA, A. I.